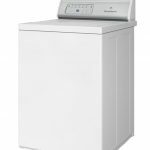 Home › Uncategorized › Best Non High Efficiency (HE) Washing Machine, Speed Queen! When I purchased my house I purchased a high efficiency washing machine from one at the local big box stores (Lowes, Home Depot, Walmart, Sears, etc) in the middle of the price range. It was a pretty basic 4.1 cuft capacity high efficiency machine with a variety of settings for different amounts of soiling, water temperatures, and I could even select the water level (or so I thought). Since that time I always set the water level to the largest setting and it always filled about half way. Over the past seven years I’ve attempted to compensate for the low water level by pouring water in the drum, using less soap, and only running half a load in an attempt to get everything under or near the water line. I never felt that my clothes were getting clean, but had no other alternatives due to government regulations. Plus the high efficiency washing machine ran much longer than the older washers (an hour and ten minutes). I found that laundry took all day and I had to set alarms / reminders or I’d forget about laundry altogether. The straw that finally “broke the camels back” was when my girlfriends dog got sick on the bed and the comforter did not get clean after 4 attempts through the washing machine. I went on one of my frequent rants bashing my high efficiency washing machine and Department of Energy for instituting these regulations while sprinkling in a few colorful 4 letter words. I had visions of my ensuing mid life crisis, only mine did not include a fancy red sports car. My vision included several rows of expensive laundromat quality washing machines lined up in my basement as I was certain I could only purchase them at some minimum quantity. I also had visions of starting a washing machine company. How difficult could it be to strap a motor, controls, and a few actuators to a 50 gallon drum to do a load of laundry. Heck I could do a better load of laundry than my high efficiency washing machine using only a kiddy pool, garden hose, and a sturdy stick. Before I reserved myself to beating my clothes against a rock down by the river, I decided to give my search for a solution one more try. I scoured the big box stores web sites and there were a few rays of hope, but nothing panned out. One machine was not listed as high efficiency, had some control over the water level, and it had great review. However, I found that it was truly a high efficiency machine after downloading the manual and finding that it clearly showed how to properly load the machine with the clothes above the water line. I quickly found that the big box stores only market settings and features that the have some resemblance of control, but don’t include information that would allow me to make a truly informed decision (i.e. water usage and duration of the wash). I found the solution to my laundering troubles buried in the comments of a review of this high efficiency washing machine… Speed Queen. Speed Queen!… I want to shout it from the rooftops! The Speed Queen washing machines have successfully side stepped government regulation using good old fashioned american ingenuity. 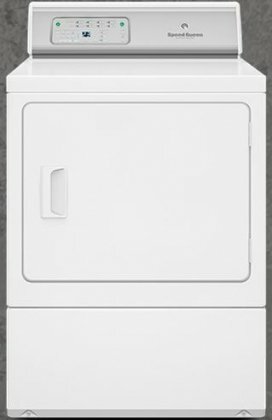 The Speed Queen washing machine’s “Normal / Eco” wash setting satisfies the Department of Energy’s government regulations and technically qualifies it as a High Efficiency washing machine; however, all other preset cycle settings on their washing machines Fills the Entire Tub with Water. The “Normal / Eco” cycle setting uses less hot water to save energy and includes a spray rinse to reduce water consumption. There are 9 other preset cycle settings on their high end electronic model and 5 on their base model (that fills the entire tub). There is No Lid Lock that prevents you from opening the lid at any time to stop the cycle and verify the claims of a full tub of water. The Speed Queen top loader washer manual does recommend the use of HE soap; however, I suspect that this is only in support of the “Normal / Eco” setting. 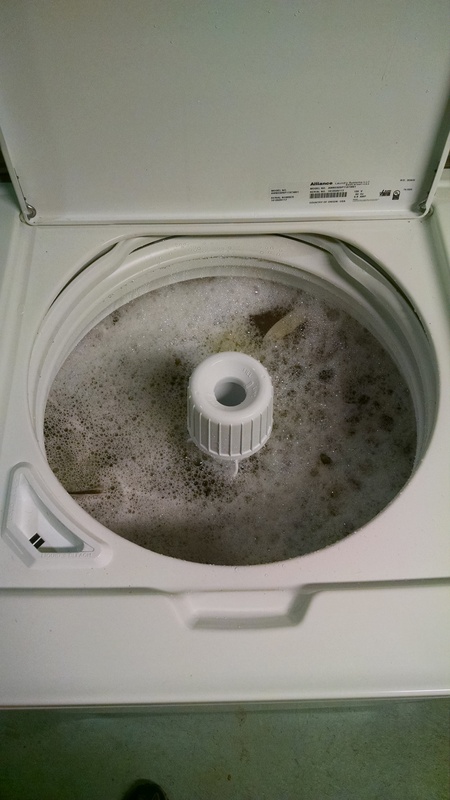 This s a picture of my king size comforter during the wash cycle in the Speed Queen top load washer (3.3 cu ft capacity). This picture was taken after my girlfriends dog had gotten sick on it (mentioned previously) and 4 attempts to clean it in my old high efficiency washer. There was some room in the tub to spare for clothes and the water level couldn’t get any higher. There was clearly some excess soap in it, but I’m not sure whether that was due to the prior 4 frustrating attempts to get it clean or was built up over time. The comforter was clean after the first attempt in the Speed Queen and the excessive soap was removed with a second rinse. Probably could have gone through a 3rd rinse (which is an option on the high end model), but I didn’t feel that the was necessary. I can’t believe the ridiculous rituals I performed while trying to do laundry with the high efficiency machine. The Speed Queen just works! The only less than optimal thing I’ve read and experienced is that the water stops when the lid is open, but I suspect this is a safety precaution and is only a minor inconvenience. Using the Speed Queen felt like my life was on fast forward. 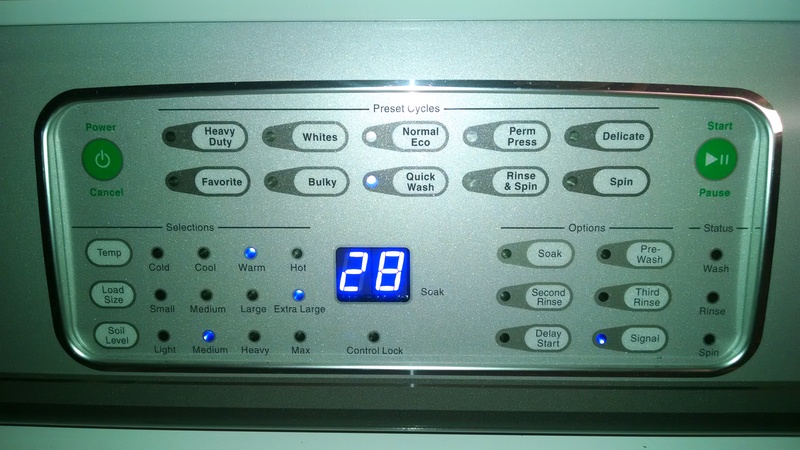 The Total Wash Time Ranges Between 27:55 Minutes and 32:55 Minutes vs over an hour in my old high efficiency washer. The time savings alone makes the Speed Queen washer a sound investment. The wash cycle options range between 12:45 and 17:45 minutes depending on whether you use the quick wash (12:45), perm press (13:45), heavy duty (15:45), whites (17:45), or bulky (17:45) settings. The rinse takes another 10:10 minutes, and the final spin takes 5 minutes. You may also choose to add an additional soak (37:00), pre-wash (13:10), second rinse (10:10), and third rinse (20:20) to your wash cycle at your discretion. The Time Remaining Display eliminates guesswork by clearly showing when the laundry will be finished. 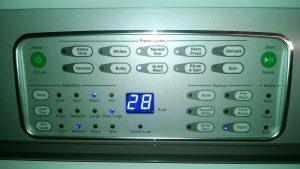 The picture is of the high end speed queen top load washer controls. The base model includes 6 of the 10 presets cycles, 3 of the 4 temperature / load size / soil level selections, and 3 of the 6 options of the high end model as defined in the following table. It should be noted that only the controls differ between the base mode and the high end model. All other components are identical between the two electronic models. The installation of the machine was no different than the standard washing machine. Just a hot and cold water supply, a drain hose, and a plug that uses the standard 15 Amp wall outlet in your home. I installed it myself using Speed Queens instructions without incident or concern. The Speed Queen is noticeably heavier (195 lbs) than my prior high efficiency washer. As a result, there was virtually no motion of the machine and very little noise during the spin cycle even though I neglected to level the machine during the initial installation. Whoops! I also noticed that when I attempted to pull the agitator to the side the machine dampened the motion significantly as opposed to flopping over like it did in my old high efficiency machine. I think the dampening of the drum compensated for my oversight to level the machine. The Speed Queen also includes an automatic balancing system with self leveling rear legs. 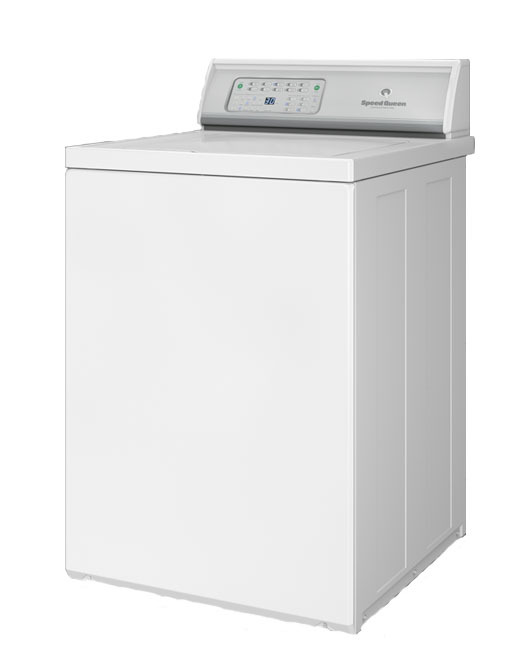 The Speed Queen top load washing machines are built for commercial grade performance. Since 1908, Speed Queen headquartered in Ripon, Wisconsin has provided commercial machines commonly found in laundromats, hospitals, fire stations, hotels, and military bases for more than a century. Speed Queen’s washers intended for home use are built on the same production line and use the same components as their commercial products. Speed Queen equipment is tested to last 10,400 cycles or 25 years in the average home. This is largely due to their generous use of metal components. In fact, it seems the only difference between their commercial products and the home use products is their generous warranty offer for their home use products. The electronic models for home use comes with a 5-year warranty covering all parts and in-home labor, a 15-year limited warranty covering the transmission, and a lifetime warranty of the outer drain tub and stainless steel wash basket. The Speed Queen top load washing machines are not available through your local big box stores (Lowes, Home Depot, Walmart, Sears, etc). 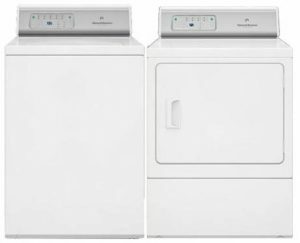 At the time of this article, the high end Speed Queen top loader washing machine, AWNE92SP113TW01, was available for $999 and the base model, AWNE82SP113TW01, was available for $899. I verified these prices through two of the 2,700+ authorized dealers listed on SpeedQueen.com. Initially, I thought these prices seemed high until i compared the price to the 51 top loader washers listed on Lowes.com. Of the 51 top load washers listed on Lowes.com, 11 (or ~21%) were available for no less than $1,000 and none of them appeared to fill the entire tub with water. In addition to the dealers listed on SpeedQueen.com, you may want to consider searching for deals on Amazon. Please let me know if you have any questions, comments, or concerns in the comments section of this article. ‹ Are You Compensated Like the Top 1% of Engineers? I recently purchased an HE Maytag and hated, hated it. No matter what I did I could not get enough water to wash the clothes, EXCEPT I had to use deep sense wash, which fills the washer, to wash my towels which are a small load. The time to wash a load was also ridiculous. Oh, would always have to add a rinse cycle to get the clothes rinsed. I thought I was going to lose my mind. After much research I returned it and traded for the Speed Queen. I am thrilled. Gives enough water, gets the clothes clean and takes half the time. Oh and I don’t have to fill the tub for a small load. So much for water conservation. awesome review on the Speed Queen. I hate, hate, hate my HE washing machine. (I thought it was just me not doing something right) Thank you so much for this info! 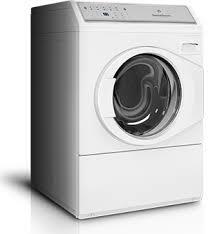 A must read article for those who are looking to buy washing machine. Thanks for sharing. Thank you for this interesting article. My old washing machine (Kenmore) gave out after after 19 years. I have seen washers in two stores, all he. The second salesman told me about using the he soap. That made me think of my experience of getting giant hives many years ago, after using two particular brands. When I searched the internet tonight I found many people who had severe skin problems from using the he soap. I will definitely search for a top load NON he washer that can use the Arm & Hammer for sensitive skin – no more hives in 25 years. This machine has tackled everything I’ve thrown at it. I’m 99% sure you could use your Arm & Hammer for sensitive skin soap. It cleaned my comforter that the dog got sick on and my clothes havent felt cleaner. Only one setting is HE and I never use it. Plus if you are really concerned, there is an option for a second and third rinse. I’ve had this washer for some time now and I continually recommend it. A co-worker was complaining about his front loader just this week. I was thrilled to read this article. Our beloved Maytag is around 18 year old and is now making some strange sounds so we’re thinking we should be proactive and replace it. But having used my son’s HE washer and being less than impressed (clothes smelled upon completion of wash) along with other misgivings about HE, I was not looking forward to the obvious choices I was seeing. So, thank you for writing this thorough article. Since it was written in 2017, I can only hope the Speed Queen is still available. Off to find out……. Do you know if there’s a way to alter the water sensor (or whatever it is) so the HE machines fill to a sufficient level? Also, what about creating a “protest holiday,” where everyone leaves their faucets on for 12 hours in the name of the DOE’s HE washer mandate. Where there’s a will there’s a way. However, it may also change the Dynamics of the machine too. That said, if there was a way to alter my prior machine, I would have been willing to try it. Hi, I’m reading this in 2018. I really need a new washer (not HE, with all the problems they have!) and liked your review on Speed Queens that circumvent that (you had me sold). However, have they changed the 2018 models? Do they all have the lid lock now? As I routinely recommend the Speedqueen washers and I’ve received a couple comments recently regarding changes made to the 2018 models I gave the company a quick call to investigate. Speedqueen has made several changes to the 2018 models due to government regulations. First off, I did verify that the 2018 models do fill the entire tub with water. The 2018 models do include a lid lock, but the machine can be paused and opened at any time so there should be no issue verify that the 2018 models fill the entire tub with water or adding additional garments after the cycle started. However, it may not be as convenient to have to manually pause and restart the machine. Speedqueen has also moved away from offering mechanical rotary controls and is only offering push button electronic controls on all 2018 models. Speedqueen has also incorporated a quieter pump and a larger motor (from a 1/2 horsepower motor, to a 1 horsepower motor). The typical wash duration increased to 36 minutes, but I still find that more than acceptable when compared to the 70 minute cycle of my old HE machine. OMG!!! Thank you! Thank you!!! I am going to look into this immediately. I absolutely hate my washing machine that I purchased for the same exact reasons as you have described. I have been searching and searching and searching for something like this. Thank you again !! OMG thank you so much for this article. I hope I can find someone to buy my piece of crap LG model. Is there a specific model I should look for in the 2018’s? You’re welcome. I enjoy my top loader and Speed queen is currently offering 3 models. The differences are the number of features on the control panel, the price, and the duration of the warranty. Otherwise they are structurally the same, so the final decision is really your personal preference. I won’t say that lol. I was looking at other reviews on the Speed Queen and found these from CNET. Sounds like the 2018 model may not live up to the old ones? Thank you for the articles. I’ve received a couple inquiries similar to this regarding the 2018 model and I have a couple observations for you to consider. Both CNET reviews start out bashing the look of the machine. I for one keep mine in an unfinished part of my basement, so this is not a concern for me. The CNET article faults the lower capacity of the Speed Queen machine. As indicated in my article, I went from a 4.1 cu ft HE machine to the 3.3 cu ft Speed Queen. When I did so, I found that I was actually doing more laundry per load. Since the Speed Queen fills the entire tub with water, I was no longer doing partial loads in an attempt to get all my clothes below the water line. “Speed Queen washing machine’s ‘Normal / Eco’ wash setting satisfies the Department of Energy’s government regulations and technically qualifies it as a High Efficiency washing machine; however, all other preset cycle settings on their washing machines Fills the Entire Tub with Water. The “Normal / Eco” cycle setting uses less hot water to save energy and includes a spray rinse to reduce water consumption. I have never used the “Normal/ECO” setting on my Speed Queen washer and my clothes have never been cleaner. I don’t have my washing machine in front of me at the moment, but my digital records indicate that it’s a AWNE92SP113TW01 and it was purchased in January 2017. It is most comparable to the TR7000WN model in 2018. Your article hits the mark. I am looking to replace my apartment sized HE washer as it takes enormous amounts of time and leaves my clothes smelling mouldy – from the beginning. Does the Speed Queen come with the non HE features in a small “stacker” size? Speed Queen does sell a front load stacked washer/dryer. I took a quick read through the information and the “quick wash” appears to take about 26 minutes (if I did the math right). It also has a “Normal ECO” setting that uses less water during the wash/rinse cycles and colder water for energy savings. The machine measures 26 7/8 wide x 78 3/16 height x 31 3/8 deep with hoses and weighs 380 lbs. 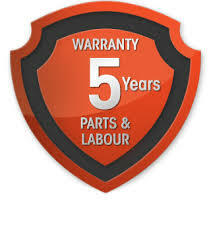 It also has a 5 yr warranty. Below are links to information you may find useful. Use & Care manual for the washer & dryer. I am SO happy to have stumbled upon your all-encompassing rant about those useless HE washing machines! 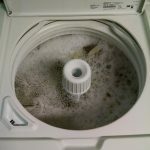 While researching replacements for our latest pieces of junk, I came upon your blog on those ‘environmentally friendly’ washers. I swear, the whole time I was reading it, I was nodding my head and saying “YES!, YES!, and YES! I have not had a decent washing machine in over two DECADES and, like you, have resorted to the same futile attempts to trick the machine into doling out some clean clothes. My husband and I are going to give the Speed Queen a try. Thanks again, Michael, and Happy New Year to everyone! Thank you, thank you, thank you for this. My wife and I have been going nuts with a new HE model we got about 2 weeks ago and luckily we are getting to return it for a full refund. The bad part is we will not have a washer. We were going to shop for a good old reconditioned one. After reading this I will for sure be researching the Speed Queen. The quality and warranty for the extra money would seem to be worth it. The G.E. 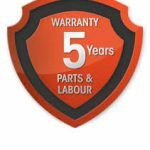 we are returning has a 1 year warranty. Shows the faith they have in their product. If someone can’t afford one I would recommend you get you get your old one fixed before purchasing a HE. JUNK!! Do your research and read the reviews. Thanks again Michael. I did notice neither indicates cycle length or auto/manual abilities. I checked what they do recommend and those are all HE. Would you please take a look and see why they rate it so bad before I shell out over $1,000? I’ve seen the CNET article and provided my response earlier in the comments, so I wont touch on them again here. As for ConsumerReports, the article/video at the associated URL shows that the speed queen got a poor rating when evaluated using the Normal ECO setting. Per my writeup, “Speed Queen washing machine’s ‘Normal / Eco’ wash setting satisfies the Department of Energy’s government regulations and technically qualifies it as a High Efficiency washing machine; however, all other preset cycle settings on their washing machines Fills the Entire Tub with Water. The “Normal / Eco” cycle setting uses less hot water to save energy and includes a spray rinse to reduce water consumption.” I have never used the “Normal/ECO” setting on my Speed Queen washer and my clothes have never been cleaner. Of course, this is the first time I’ve seen an evaluation of the Heavy duty cycle and they gave it a fair setting. During the video at around the 1:30 mark, they appear to demonstrate the settings they used (Heavy Duty, warm/cold, auto fill, and max soil level). If I was really trying to get tough stains out I would probably use hotter water. I would probably also opt for the large load setting instead of using the auto fill option. Using the large load setting would ensure that the tub filled entirely with water. I might even exercise the soak and pre-wash settings on the washer too. It’s interesting that they show a Kenmore washer at around the 1:40 mark in the video when discussing the agitator design while only verbally discussing the Speed Queen and Maytag machine. Please note that the Speed Queen machines are capable of filling the entire tub with water versus what is shown in the video (using the Kenmore machine). I suspect that they used the Kenmore machine to demonstrate an agitator design since the new Speed Queens have a lid lock, but this could be misleading. I recognize that the more recent washers are a slightly different design than the one I have (see prior comments regarding updated design details), but if I was buying a new washer today I wouldn’t let the consumer reports article dissuade me. I would buy another Speed Queen. However, given that the Speed Queens are designed for 25 years of residential use, I suppose I won’t be making that decision again until 2042. Michael, concerning the new 2018 Speed Queen model number “TR7000WN”, from my review of the operation features, this newer version is very similar to the previous “AWNE92SP113TW01”. Have you been able to verify if these two machines indeed have the same NON-HIGH EFFICIENCY features? Thanks for your research and info. I did a quick Google search for that model number (AWNE92SP113TW01) and found a review stating that it does fill the entire tub with water in the non-“Normal Wash” settings. It’s not clear what year that model number is from, but I did previously call Speed Queen to verify that the 2018 models filled the entire tub with water (and they did). If you have questions regarding a specific Speed Queen model you may also wish to contact them directly at (800) 552-5475. Each time I have called them they have always been more than willing to help and seem to really believe in their product.